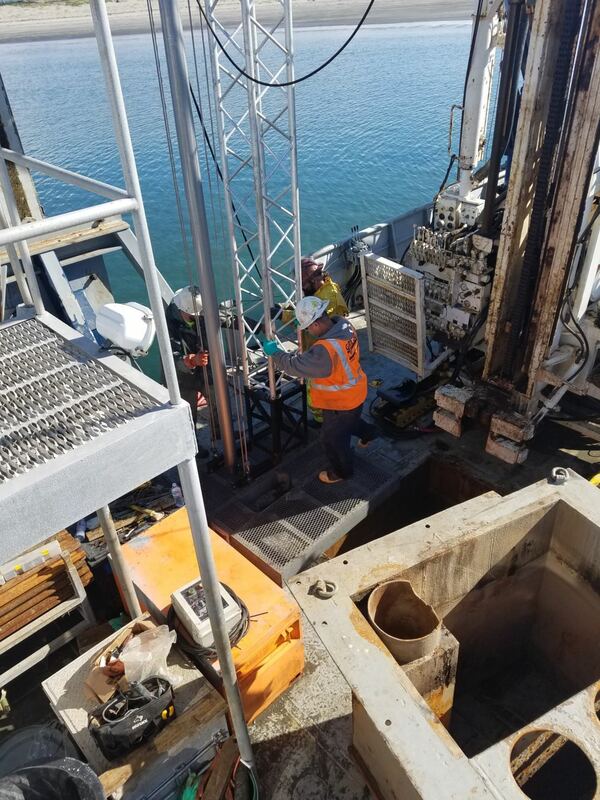 Group Delta managed the geologic interpretation and engineering analyses to prepare a geotechnical investigation report for a new ammunition wharf (1,090-foot long by 125-foot wide) with associated turning basin, breakwater, boat channel and causeway. The purposes of the report were to: 1) characterize the site seismic, geologic and subsurface conditions; 2) identify potential geotechnical constraints that could substantially increase construction costs; and 3) provide geotechnical information to develop preliminary designs and construction cost estimates. The subsurface exploration consisted of 18 exploratory, 19 cone penetrometer (CPT) soundings and six Vibro-Cores. Six of the borings and five of the CPT soundings were conducted on land. The remaining explorations were completed within the bay using a self-propelled ocean-going vessel. Group Delta completed detailed analyses to develop design ground motion parameters, liquefaction and secondary effects, slope stability, settlement, pile capacity, kinematic loading on piles, lateral pressures and resistances for sheet pile bulkheads. The geotechnical investigation report provided preliminary geotechnical design parameters and recommendations wharf, dolphins and breakwater piles; truck turnaround bulkhead; breakwater alternatives; causeway; security barrier, dredging; and surface improvement on the eastern mole. The geotechnical investigation report was prepared under an accelerated schedule of 20 working days from completion of the subsurface exploration. The report was well received by NAVFAC SW and they had no formal comments.